and small woodpeckers all feed from this stunning birdfeeder. These gazebos are absolutely stunning! 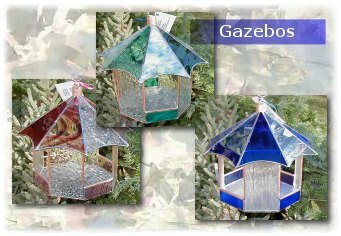 They are 8-sided, made with clear glass panels on 4 sides - allowing you to view the birds from any angle, yet affording them some protection from rain or snow. All glass is trimmed in copper, and the roof can be accented with alternating copper panels. This feeder comes ready to hang with a copper hook, but can also stand on a table or deck railing. The opening allows chickadees, cardinals and finches to enter to feed, but keeps out jays and grackles. Approximate size is 10" diameter x 9"high.